Gifting connoisseur, Debbie Durkin does it again with her amazing celebrity gifting suite, which boasts some of the finest Eco-Friendly products in the industry. This year’s suite was an invite only event at the Stardust Penthouse in the Beverly Hilton hotel in the heart of Beverly Hills. The suite featured a photo booth and music from the renowned, Mike Shay of Vanderpump Rules. Charity surrounding the event was through Shriners Hosptial for Children who are gearing up for their new Pasadena hospital to open. This season’s celebrity lineup included: Adina Porter, Courtney Stixx, Bai Ling, Brock O’ Hurn, Carly Steel, Chris Mac Donald, Frank Stallone, Gilles Marini, Heather Mac Donald, James Kennedy, Jamie Brewer, Janelle Evans, Johnny Evans, Johnny Wujek, Lawrence Zarian, Max Vanderpump, Nicky Whelan, Pandora Vanderpump, Rob Sternberg, Sam Larsen, Shar Jackson, Tara Reid, Tom McCarthy, and many more! When it comes to beauty, Debbie’s lounge always has the best makeup companies including IT Cosmetics who offered free touch ups for industry-goers attending. IT Cosmetics gifted a bag of all their top products designed by the top plastic surgeons and dermatologists, containing the purest of ingredients. The new leader in sunless tanning, Sugared and Bronzed offered free spray tans. Refreshments included La Croix Sparkling Water who featured their fruit-infused waters. Industry goers loved the refreshing taste of La Croix. Other tastemakers in this years suite included sweet bites by Candy Vixen Custom Candy Buffet . Fete was another popular winemaker that returned to this season’s Eco Luxe lounge offering bottles of their Petite Sirah poured in to custom glasses with the Shriners Hospital logo. Chariot Travelware’s Moon Woo came back again for Oscars promoting his luggage line. Suite-goers were gifted three piece luggage sets. 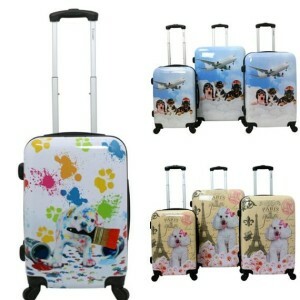 Chariot travelware is known for its distinctive dog collection. The Jamaician Tourist Board offered exotic getaways to the Caribbean for attendees. Although travel was a large part of the suite, fashion also took center stage with brands like Burnetie Shoes . An Oscar favorite this time around were Burnetie’s High Top X pink sneakers! Amy Radzik also featured her jewelry line AR & Productions http://www.amymarieradzik.com/home.html . Each of the custom pieces are designed to help you feel happy, confident, and beautiful! Last but not least, Armani Wells featured a man glam lounge. Store owner, Claudia Wells and former star of Back To The Future was on hand to gift amazing brands from her store some of which include Canali, Prada, and Ermenegildo Zegna. As the evening came to a close, guests enjoyed the after event on the rooftop of the Beverly Hilton, “Salute to the Oscar Noms”, benefiting the Los Angeles Shriners Hospitals.